LIVE THE SUNSHINE COAST LIFESTYLE! SEAVIEW VILLA ESTATES, WEST SECHELT, B.C. PHASE 1 COMPLETED AND SOLD OUT! REGISTER NOW FOR A VIP PACKAGE, TOUR OR VISIT SEAVIEW'S SHOW HOME OPEN FROM 12 NOON TO 3PM SATURDAYS OR BY APPOINTMENT ! Concept Design for "TERRACES AT SEAVIEW"
Seaview Villa Estates has been completely redesigned with new and exciting plans for our next 3 phases. Plans include forty condo apartment homes ranging from 600 sq.ft. to1,000 sq.ft. to 1,200 sq.ft. and 1,400 sq. ft. Eleven of the condo apartments are third floor penthouses.Potential purchasers can combine apartments if they wish larger units. 3 more phases are planned including Building C with 14 condo apartment homes to be offered for presale and built. Building C will be followed by building B of 12 homes and building A of 14 homes. 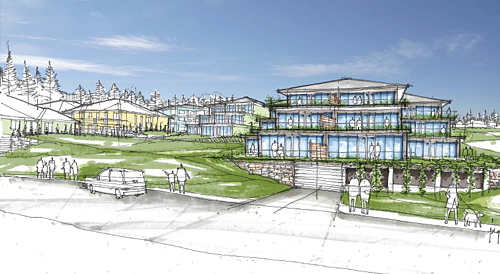 Please refer to architectural design sketch and proposed Site Plan for "Terraces at Seaview." Time from construction start to completion for each building in each of the remaining three phase is 9 to 12 months with actual dates dependent on pre-sales for each phase. The new proposed Site Plan and design concept for "Terraces at Seaview"include 3 two storey and three storey horizontally and vertically stepped buildings to the oceanview following Seaview's natural sloping topography. Architectural plans have been designed to maximize ocean and mountain views in all directions as well as privacy for all homes. All three buildings with elevators will be built to the same high quality standards of Seaview's phase 1 larger sold and occupied townhomes of 2,500 sq. ft. to 2,800 sq. ft. and are complementary in exterior design and finishing. Two buildings will have underground parking and apartments will feature well designed open floor plans, floor to ceiling glazing,one level living, fireplaces,indoor/outdoor orientation to the ocean and mountain views, spacious decks (including wrap around decks for penthouses.The latest technology energy efficient heating and air conditioning systems will be used in each building with individualized controls in each home. Site coverage is 52% compared to 75% permitted in the bylaw.Extensive open green space and landscape amenities will be provided to further enhance ocean and mountain views in all directions. Introductory prices for Building C,the first to be built reflect their floor level and views and range from $239,000 for 600 sq.ft. to $329,000 for 1,000 sq.ft. condo apartment homes, from $399,000 to $459,000 (penthouse) for 1,200 sq. ft. and $489,000 for 1,400 sq. ft. penthouse homes. the Sunshine Coast from the Vancouver area or elsewhere,want a second recreation home and/or as an investment for the future or retirement. Approved zoning is in place for 40 more homes and a new development permit (for form and character only) is required with architectural plans currently with Sechelt Planning. Register now for your VIP information package, tour, or visit Seaview's Show Home open from 12 noon to 3pm Saturdays or by Appointment. Pursuant to the BC Real Estate Marketing and Development Act, Seaview is required to include the following on its web site at this time. This is not an offering for sale.Any such offering may only be made by Disclosure Statement.E&O.E. Proposed Site Plan for "TERRACES AT SEAVIEW"
Located on the naturally beautiful Sunshine Coast,one of the year round warmest climates in Canada and a scenic 40-minute ferry from Vancouver, Seaview Villa Estates is an exclusive niche market community of 31 townhomes and garden apartments situated on 3 acres of prime ocean view property in West Sechelt.The attractively designed and spacious townhomes and garden apartments offer a relaxed West Coast lifestyle to live,work and play for people with discerning tastes. Connected to and inspired by nature,the townhomes and garden apartments feature expansive ocean views of Georgia Strait, the Trail Islands and Vancouver Island with some easterly views of Davis Bay to Mount Baker. Seaview Villa Estates ,the prime high quality development on the Sunshine Coast , which is becoming a "lifestyle choice" suburb of Greater Vancouver and the Pacific North West has opened its contemporary show home inspired by nature's colours. Seaview's show home was featured in the West Coast Homes section of the Vancouver Sun and various issues of BC Homes and Resorts magazine. Virtual tour on web site. Phase 1 of 8 villas is now complete .Phase 2 with 1 town home only available and 2 upper and lower garden apartments is now selling at introductory pre construction prices starting from $428,000 . Phase 2 anticipated start construction is fall 2009 with completion/occupancy 6 to 9 months later -2010. Pre sales for Phase 3 will follow pre sales for Phase 2 but are not being offered for sale at this time.Other phases to follow in sequence. Seaview Villa Estates is setting a new high quality standard for multi family strata living on the Sunshine Coast with its unique oceanview location,spaciousness ,low density and widely acclaimed design features. The spacious townhomes are 2,842sq.ft. on 2 levels with high quality finishing of 1,421 sq.ft. on the main floor for one level living and 1,421 sq.ft. of semi finished space at the lower level. On the main floor, Seaview's townhomes feature a spacious entry,vaulted and raised ceilings with open plan dining,living room and kitchen,gas fireplaces and master bedroom with 5 piece ensuite including a soaker tub, second bedroom,den or office, second bathroom and laundry room.All townhomes have large south facing energy star windows, extra large size entertainment decks taking full advantage of ocean views and feature attached double garages leading into the homes for added privacy and convenience. Seaview's new smaller upper and lower garden apartments have been introduced for Phase 2 and 3 in direct response to consumer demand and input re smaller sizes wanted and affordabilty.The upper garden apartments of 1,262 to 1,415 sq.ft. and lower garden apartments of 1,245 to 1,380 sq.ft. are modelled after the same popular show home townhome design and each feature an open plan dining,living room and kitchen,gas fireplace,master bedroom with 5 piece ensuite including a soaker tub,second bedroom,second bathroom , laundry room and storage room. Upper garden apartments have vaulted ceilings with large south facing energy star windows and extra large size entertainment decks while the lower garden apartments have 9 foot ceilings and large patios.One attached garage is provided for each garden apartment. Seaview Villa Estates is a licensed registered builder with the BC Home Protection Office and offers a 2,5 and 10 year extended warranty through National Home Warranty Programs.Seaview purchasers also receive a customized and comprehensive Warranty Resource binder for their home designed to provide years of worry free ownership related to all components and workmanship outside and throughout their home. the townhomes have 9 foot ceilings and are being semi finished as part of the purchase price to include dry walling, prime painted,ceilings lights , choice of carpet and include sliding glass doors to south facing patios. Downstairs layout features extra large recreation, family or media room,2 bedrooms or office, plenty of storage ,bathroom and mechanical room.Lower levels are fully adaptable to an in law or guest suite with an upgrade option offered to fully finish downstairs' living space. Seaview Villa Estates is a well planned phased development of 5 phases with homes in the first phase completed and occupied , second phase construction is anticipated to be starting fall 2009 ( dependent on pre sales)with completion in 2010. Construction of other phases will follow. Phase 2 is now selling at introductory pre construction prices from $428,000. Purchasers can buy their oceanview home with 10% down payment for completion a year later. Phase 1 financing partner was the Royal Bank. Market potential is excellent for these exclusive,high quality townhomes and garden apartments as there is no comparable new product on the Sunshine Coast market . Nothing in the Vancouver Lower Mainland can compare for quality, price,spaciousness,low density and with an oceanview. 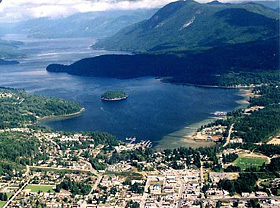 Adjacent and surrounding properties are quality existing and newly- built single family homes .The easy to build site, with all underground services completed in Phase 1, is in close proximity to parks ,schools ,with nearby golf course,marina, ocean beach access 5 minutes away and located minutes from downtown Sechelt- the heart of the Sunshine Coast- which is recognized as one of the best real estate markets for value in British Columbia. Pricing structure of Seaview's townhomes and garden apartments is being continually reviewed to adapt to changing market conditions , construction costs, consumer demand and acceptance.Phase 2 garden apartments and townhomes are now selling at introductory pre construction prices starting from $428,000. This is a niche target market -ie young professional couples who work from home and people age 50 plus who are selling their larger single family homes who want to downsize in style,change their lifestyle and who want spacious, low maintenance ,high quality garden apartments and townhomes in an exclusive low density community in close proximity to Greater Vancouver.Seaview Villa Estates is also attracting people looking for recreational property(to retire to later) and as an investment.The townhomes and garden apartments feature attractive California/Florida inspired contemporary exterior pastel colors ie mint green, light "ocean wash" blue and mellowed ivory to reflect the sun's warming rays in summer and for a" lighter look" in winter. Natural stone accents and quality detailing provide additional aestethic appeal.Interior finishings are high quality with vaulted ceilings,open floor plans,contemporary gas fireplaces, granite kitchen islands , soaker tubs in ensuites, energy star stainless steel appliances, energy efficient furnaces and hot water heaters, hardwood flooring, plenty of storage, extra large low e windows providing plenty of natural light, spacious decks to the oceanview and lower level patios. All townhomes have attached double car garages leading into the townhomes for added convenience and privacy and garden apartments have one enclosed garage. Seaview Villa Estates will have a prestigious natural stone entry(not gated ) with exceptionally well landscaped grounds featuring indigenous materials and plantings and irrigation system. The density of Seaview Villa Estates is two thirds of what Sechelt's bylaw allows. 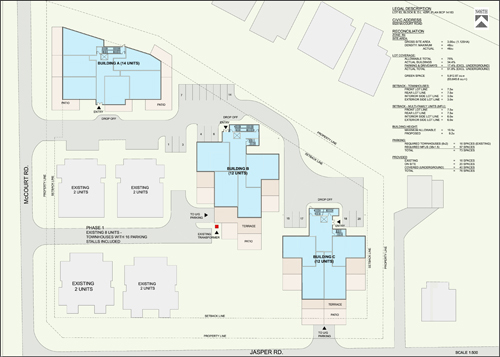 Purchasers of Phase 1 are from the Sunshine Coast,B.C. ,Ontario ,the United States and Europe. Seaview Villa Estates is also attracting considerable interest from Alberta residents discovering the natural beauty, amenities and moderate climate of the Sunshine Coast. Timeframe - Phase 1 completed with occupancy summer 2007 , second phase anticipated starting construction fall 2009 with completion in 2010 and other phases to follow.Actual dates will be posted on the web site and are subject to meeting pre sales requirements of Seaview's financing partner for each phase. All homes in Seaview Villa Estates have southerly ocean views of Georgia Strait,the Trail Islands and Vancouver Island with some having additional easterly views to Davis Bay and Mount Baker. The Seaview Villa Estates' professional team has a wealth of combined expertise with over 75 years of "hands on" experience in development,construction and marketing. Developer is Seaview Villa Estates Ltd ,President Joan E. Gadsby,North Vancouver .Joan Gadsby is a former Senior Business/Marketing Executive with 4 of Canada's largest companies for 28 years and is a former North Vancouver District Councillor for 13 years.Prior to purchasing and developing Seaview's site, Joan was providing diversified consulting services in strategic marketing,real estate,property development and municipal related issues to major developers and private and public sector clients. Project Builder for Phase 2 will be announced shortly with three multi family builders with the experience,quality and craftsmanship skills having expressed a strong interest in becoming Seaview Villa Estates ' builder partner. Synopsis updated August 7,2009.Updated photos including low altitude aerial pictures of site and ocean view and completed Phase 1 homes including the show home are in Progress section of this web site.Virtual tour of show home also on web site. Disclaimer:The Developer reserves the right to make changes and modifications to plans,specifications,features and pricing as it deems necessary in its sole discretion and without prior notice. The Developer reserves the right to make changes and modifications to plans, specifications, features and pricing as it deems necessary in its sole discretion and without prior notice.